You are here: Home / Education & Schools / Education in Malta: any room for alternative models? Education has repeatedly been a hot topic in Malta. The schooling sector has seen all sorts of church-state interplay and ruckuses from the 60s to early 90s. Now, in times of more measured reflection on education, we’ve the new National Curriculum framework, which, election aside, is set to finally move from draft stage to reality, teachers and parents duly consulted, apparently. But is the new curriculum an opportunity or an opportunity missed? Some would say the latter, and not just the Labour Opposition. More or less every 10 years, the government (of the day) takes a look at education and devises a ‘new approach’, full of promise, to the curriculum. But, we’ve seen some dissenting voices recently, even from erudite personalities at the heart of Malta’s educational establishment. One of the supposed shortcomings of the new curriculum many point to is its rigidity; its inability to allow schools room to experiment, innovate and inspire. In fulfilling the curriculum requirements, schools may have little time left to offer experiences that differentiate them or are adapted to their particular student intake. Increasingly, there are parents in Malta wondering how to breathe fresh air into their children’s education and opt for alternatives to the state-church school dominated sector, and the fairly limited choice of international and/or private schools which do make some attempt to do things differently. Unsurprisingly, a good many parents seeking alternatives to the current educational offer are foreigners living in Malta. Their assessment of the local educational options is serving to highlight also to local parents though the limitations of Malta’s schooling. Clearly, foreigner parents here, who have no Maltese roots or prior linkages to the Islands, are reluctant to have their children straitjacketed in an educational system serving predominantly a nation’s aims, as they see it, rather than children’s needs, whatever their cultural background. They are banding together, attracting interested Maltese parents, and trying to work out how to bring alternative educational approaches to the Islands, within whatever legal frameworks they are duty bound to operate. Alternatives they are looking at, like the Waldorf system, are well established elsewhere in Europe but have yet to find a place in Malta. Julian Saez and his wife Deirdre – Spanish and Irish nationals respectively – are two such parents. They school their two young daughters at a Waldorf school in Spain for half the year, but spend the other half year in Malta. While relatively happy with the schooling here in Malta, they can see how it falls short in delivering the enlightened schooling their daughters receive in Spain. Julian is on a drive to see whether it’s feasible to set up a Waldorf or similar type of school in Malta. Here’s he explains why he and Deirdre are on a mission to find out. How did you end up being interested in educational models and methods? My wife, Deirdre, is a very experienced psychologist, with a long background in education. I’m an engineer and one of my passions is learning and teaching. I’m also lecturer in Murcia University in Spain. So I suppose we’re both more attuned to thinking about educational systems and aware of pedagogical methods than many parents. What frustrates you about traditional national curricula? Through my learning about education, I found that to have the potential to succeed in life, and in school, you need more than the traditional approach based in IQ. The IQ-competitive model of education has been demonstrated to be obsolete (it started life in the ‘60s). For decades, a lot of emphasis has been put on certain aspects of intelligence such as logical reasoning, math skills, spatial skills, understanding analogies, verbal skills and so on. Researchers were puzzled by the fact that while IQ could predict to a significant degree academic performance and, to some degree, professional and personal success, there was something missing in the equation. Some of those with fabulous IQ scores were doing poorly in life; one could say that they were wasting their potential by thinking, behaving and communicating in a way that hindered their chances of succeeding. After researching which pedagogical models emphasise concepts of emotional intelligence, social intelligence, and multiple intelligence and take them into consideration in devising a learning programme, I discovered the Waldorf education as an optimal model. Why did the Waldorf model strike you are a more enlightened educational option? We did some analysis of various European models of education, from personal interest, and discovered some illuminating facts. The EU’s Cost of School Failure report, 2007, places Malta at the top of the European Union league table in terms of school failure rates, at 41.6 per cent. That is, children who do not complete school leaving exams or fail to stay in education beyond the statutory minimum age. Finland ranks the best performer both in the ‘Cost of Failure’ report and in another study, the Programme for International Student Assessment (PISA), looking at the proficiency of students in core subjects – maths, reading, sciences. So, we asked ourselves what Finland was doing that could lead to it ranking number one. I looked at their educational model and saw similarities to Waldorf pedagogy. Finland has other special factors of course contributing to its overall educational success: the high professional standing of teachers; free pre-school places; a lack of emphasis on the competitiveness in education, and more. 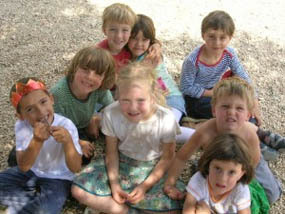 We visited a Waldorf school in Spain and I liked very much what we found. Since placing our three-year-old girls in a Waldorf school in Spain, we have been amazed at the excellent education they are receiving and notice too how happy they are. Now that we live half the year in Malta, we’d like to see our daughters having the possibility of receiving this model of education here too. I also think that Maltese people and other foreigners living in Malta should have more options when it comes to choosing the type of education they would like to have for their children. In brief, what is the Waldorf approach to education? The key to Waldorf is its premise that success is not about achieving certain scores and working hard, but that real success is much more about feeling good about yourself, being happy and optimistic, being able to enjoy healthy relationships, being fulfilled in work and having the capacity to enjoy the adventure of this fabulous life. It supports children to develop their full potential as human beings. It recognises that childhood is for children not little adults. Waldorf therefore encourages children to be able to play, explore, discover and discern their way to knowledge and understanding rather than sit at a desk and be fed information that may or may not actually serve them in life. Dance, theatre, creativity and music are the natural ways that children engage in life when given permission to do so. They are core in the Waldorf ‘curriculum’ for example. What steps are you taking to see about bringing a Waldorf or similar style educational model to Malta? Step 5: Going ahead with the project. These steps are not necessary sequential, indeed, once we’ve got a group of parents interested, we would already start actively looking for teachers and thinking about a convenient place to start the school. How can anyone interested get in touch and participate? Email me, Julián Sáez, at waldorfmalta@gmail.com. We all have reservations about the (private) schools our children are at in Malta – it’s swings and roundabouts as some are good at one thing and not another, some have outdoor space, others not. Parents here do pull children out of schools and move to others, so don’t feel that is a problem. Before leaping into another school, you will need to do some homework on them, based on your current experiences and on other criteria too. Schools do need a lot of checking out – ask around on internet fora (see Facebook for parents in Malta group, for instance), and draft a long list of searching questions when you visit. Do a checklist, such as this one I found on the UK’s Good Schools’ Guide (shame nothing similar in Malta of course!). However, if you Google ‘choosing a primary school’ ‘checklist for parents on finding a good school’ etc etc, you will find a lot of useful sites with lists. Although Malta is small, you will also need to factor in the school journey and work out if the location suits you. Few schools are in large, greenfield areas so playground and outdoor space can be very limited. San Anton and San Andrea, towards Zebbiegh, do have countryside locations, so they may be useful to look around. They also have a large international intakes, but I am not sure how English is taught to non-native or non-bilingual children. That question will clearly be key to ask of any school you view. I suggest you set wheels in motion to visit a short-list of candidate schools asap, as some have full intakes already for the coming year. Let me know if you have specific questions. I don’t really feel able here to recommend one over another as I don’t know your particular needs, nor the age of your daughter. But do check out Parents in Malta on Facebook as you might find some useful freely given help there – a lot of group members are foreign. Hello I need help. I am really worried. On the other hand, I don’ really like the school: without playground, without computer lab, without not really friendly people.. I am not sure how far Julian and his team got with the whole Waldorf initiative, as I’ve not had an update. I suggest you contact him on this mail: julsaez@gmail.com to find out. I think they did manage to run a summer school for younger children last summer. I am a Maltese citizen and have worked in Waldorf schools here in Germany for some years, Now having retired, I intend spending some time back in Malta, sort of repatriation, and would like to help setting up a Waldorf school in Malta. Hello my name is Seraina I´m born in 1994 and i want to do same social work in start july first for one or two mounth.I go to class 11 at steiner school in Germany. Last year i spent 6 mounth in India,Kottayam with the Don Bosco Sisters.I stay in the hostel with the sisters and went to school there.I like to work with children and i teach children in a sunday school in germany and i would like to work with you. I´m looking forward for your answers. thanks for your kind comments – glad to know that our content is proving valuable as you contemplate a move here. I’m going to reply to you personally on email as I feel a lengthy reply coming up! Please, everyone reading this, do feel free to chip in and give Marina some advice.And do contact Julian Saez who’s quoted in the article (email at the end of the piece) as he’s gathering good support already. Sorry, I should add that I am very excited about Julian’s plans of setting up a Waldorf school, and that would be marvellous for my younger daughter (plus, as a teacher, I would be happy to contribute in any way I can), but for my older daughter a secondary school will be needed as of September – and hopefully one where she can enjoy herself as well as learn! I love your articles, especially because they demonstrate such a depth of acquaintance with Maltese education, which is my particular interest right now. I have two daughters, born 2000 and 2006 and I would like to move to Malta. (I’m British, without prior connections, but my grandparents were stationed there for a while and I loved it.) My daughters are currently in an English-speaking Montessori school in Sarajevo, and I teach English myself, both at university level and according to the Montessori method in my daughters’ school. Obviously, a school for the children is the first thing I have to think about when moving to Malta – followed by finding out if their guinea-pigs can come with us! If you or anybody else could give me a pointer as to where the best private schools are located, especially those with more innovative education methods and a particularly friendly atmosphere, I would be very grateful indeed.